Portland struck early and often in an 8-1 victory over the Reading Fightin Phils (PHI). Mookie Betts and Deven Marrero led off the game with a single and walk, and both came in to score on a Blake Swihart double. In the second, Betts' one-out walk was followed by back-to-back home runs by Marrero and Travis Shaw. Betts' out-of-this-world play continues, as the second baseman was on base four times, going 2 for 3 with two walks and three runs scored. Betts has now scored 35 runs on the season, leading the Eastern League with 13 more than his next competitor. It was a big night for Marrero as well, whose homer was part of a career-high four-RBI night. On the mound, Keith Couch was able to pitch out of a few jams to keep Portland in control. He allowed just one run in four innings despite giving up seven hits, a walk, and hitting a batter. Robby Scott and Michael Olmsted were both brilliant in relief, allowing a hit apiece over a combined five shutout innings. Salem came out on top of an excellent pitching matchup, walking off with a 2-1 win over the Wilmington Blue Rocks (KC). Corey Littrell locked horns with 2013 supplemental first-rounder Sean Manaea, and both hurlers matched zeroes. Littrell threw five shutout frames, allowing five hits and striking out five while walking three, departing in a scoreless tie. Wilmington broke the stalemate with a sixth-inning run off reliever Kyle Kraus, but Salem responded in the bottom of the inning as an RBI double from Jayson Hernandez plated Reed Gragnani. Meanwhile, Kraus settled in and shut down the Blue Rocks for the rest of the evening. He finished with just the one run allowed in four innings, striking out three, walking one and getting credit for the win. Kevin Mager, 0 for 12 since his promotion from Greenville, led off the bottom of the ninth with a double. He was pulled for pinch-runner Dreily Guerrero who came in to score the winning run on a double off the bat of Matty Johnson. Hernandez had a big night at the plate for Salem, going 3 for 4 with three doubles and an RBI. Gragnani was on base three times with a single and two walks, raising his season line to .403/.489/.545. Johnson and Mario Martinez had two hits apiece. Greenville pounded out 15 hits in a 13-3 romp over the Augusta GreenJackets (SF). Jantzen Witte (pictured) was the offensive star for the Drive. The first baseman had three doubles on the night, driving in three runs and scoring four. 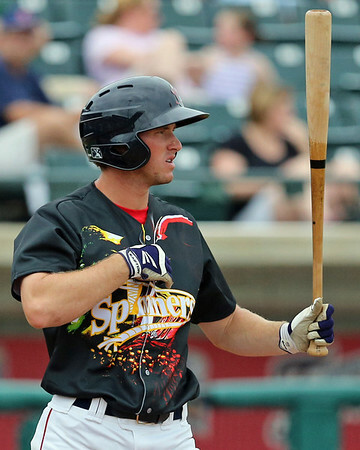 The outburst gives him the South Atlantic League lead with fourteen two-base hits. Wendell Rijo scored three times, going 2 for 3 with a triple and a pair of walks. Despite being one of the youngest players in the circuit, Rijo is tied for the league lead with 20 walks and ranks second with a .461 OBP. The league leader in the latter category is his teammate Carlos Asuaje, who was on base three times with a single and two walks. Kendrick Perkins joined the parade with a three-hit night. The biggest beneficiary of this offensive explosion was starting pitcher Teddy Stankiewicz. The 2013 second-round pick turned in a solid performance, allowing three runs on 10 hits in six innings, striking out seven without issuing a walk. The seven strikeouts shattered his previous career high of four. Jacob Dahlstrand threw three innings of shutout relief, striking out five without walking a batter. Player of the Day: On a night with many standout performances, a huge performance by Jantzen Witte earns recognition. The first baseman grabbed the league lead in doubles (14) and runs scored (26). He ranks second in OPS behind teammate Carlos Asuaje, fifth in hits, and fourth in slugging percentage. The 24-year-old Witte was a 23rd-round pick of Boston in the 2013 draft out of Texas Christian.